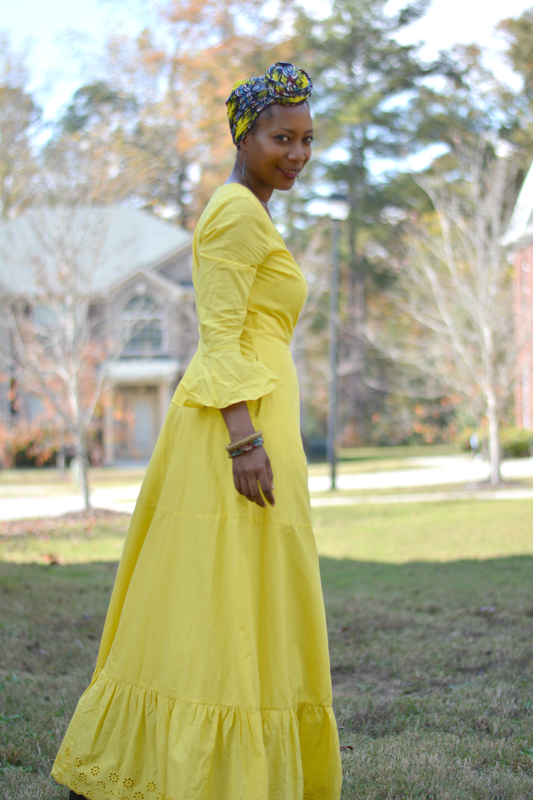 Special thanks to eShakti for adding some brightness to my fall with a yellow maxi dress. 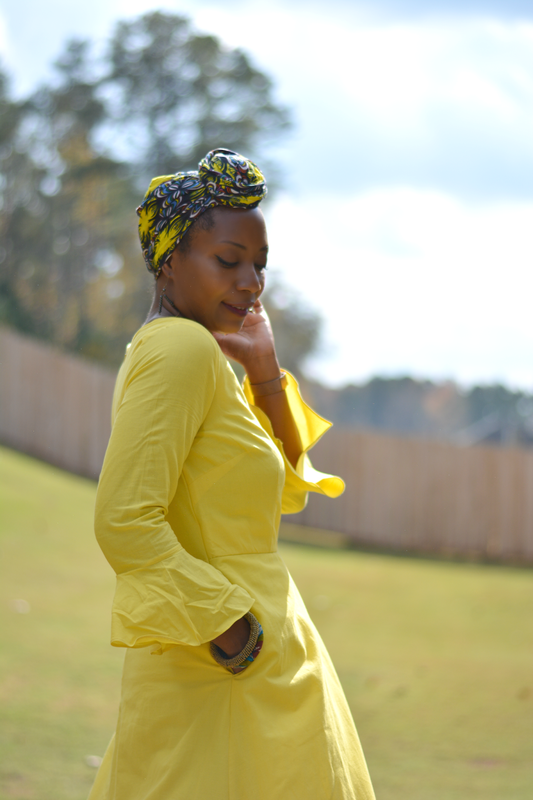 I think of yellow being a spring kind of color meant for ample sunshine and warm breezes. It's not a color I normally gravitate to in fall but I should. 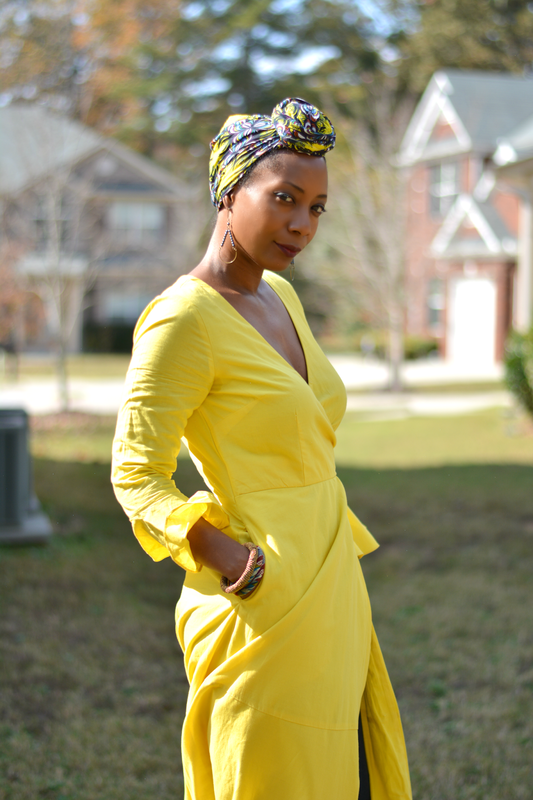 It's a happy color and this dress is definitely giving me positive vibes. 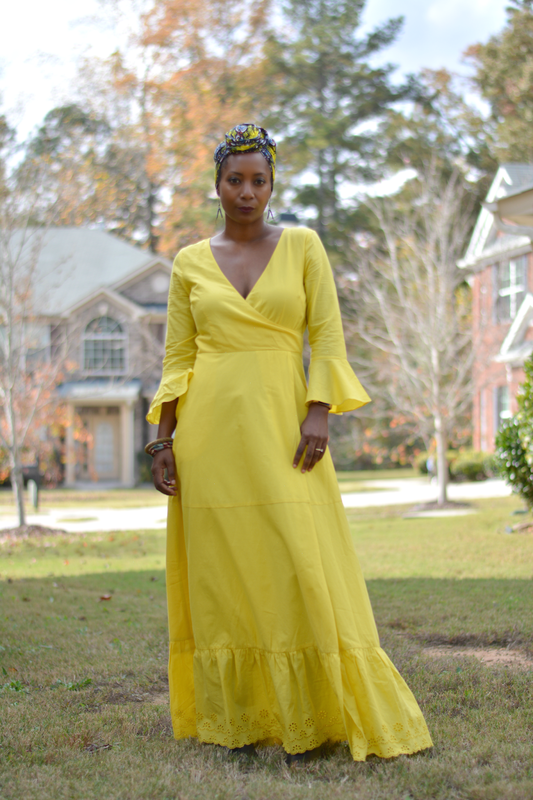 Yellow is a great color and absolutely fell in love with this maxi dress from eShakti. 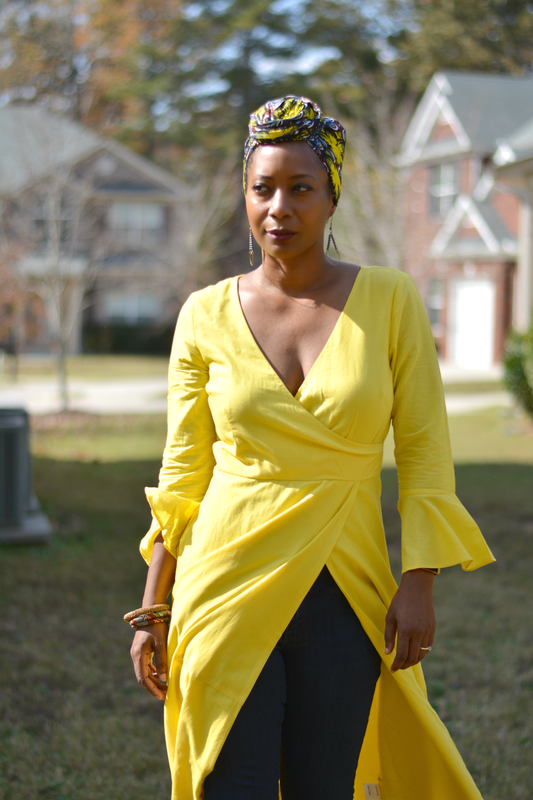 The color is summery but the long sleeves and skirt length work well as a fall piece. 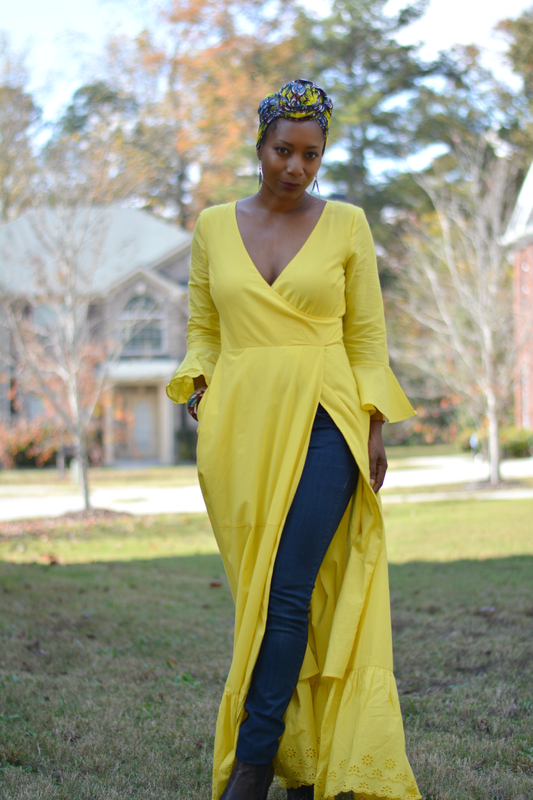 It's a dress for all seasons which I love. I need more all season clothing. I'm tired of packing and unpacking my closet. We're having our up and down weather. Right now we're in a warm spell so I could have bust out the sandals but pedicures cease in fall and my toes just aren't ready. I went with styling more appropriate for the season -- jeans and boots. The jeans are a Goodwill find from my Chicago thrift trip. I love finding jeans that come all the way up to the belly button. These are very stretchy and leggings like making for a smoother layer underneath the dress. The dress has a hidden side split opening. It's pretty risque without pants underneath. I like it. 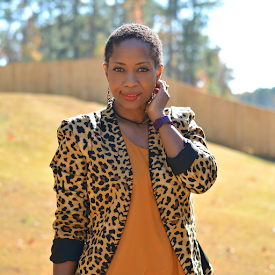 What I love about eShakti clothes is that you can have your items completely customized. Don't like the sleeve? Change it. Need more coverage up top or in the hips? That can be done too. All measurements can be adjusted for a perfect fit. My dress is also fully lined and has a nice full pocket. Those are details that you just don't see very much on dresses anymore. I usually customize on eShakti but decided to go with the standard size and details as is. I was too lazy to take my measurements and I definitely could have used a little extra room up top and a little less fullness in the hips. I would have said no to trumpet sleeves too. I'm thinking about cutting them myself. I've been tucking it in to see if that's the right way to go. See the one extra wrinkled sleeve? Overall, I'm still loving the dress and looking forward to it being the sunshine on a cold winter's day. Are there colors you don't wear in certain seasons?